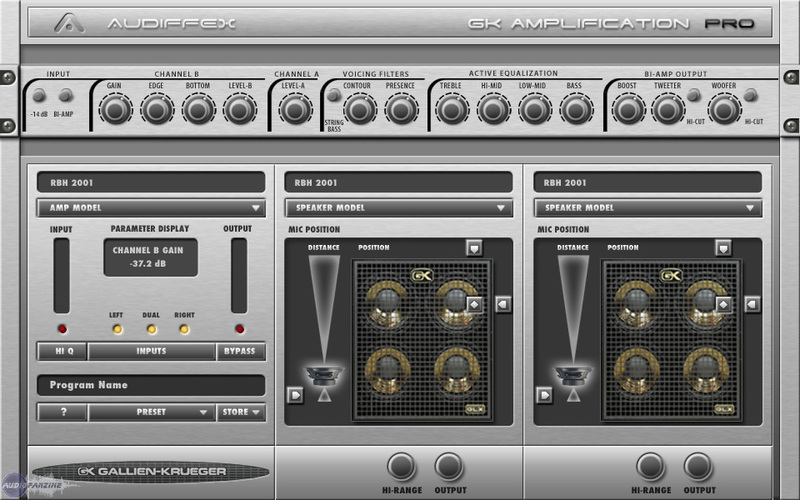 GK Amplification Pro, Software Amp Simulator from Audiffex. 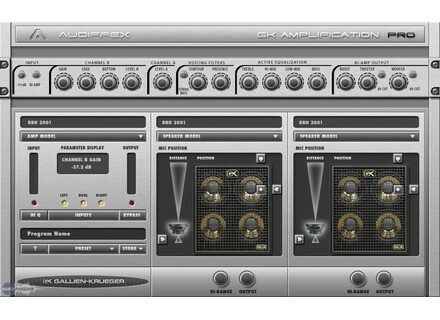 Audiffex has announced the availability of its Gallien-Krueger Amplification plug-ins, the result of the cooperation between Audiffex and Gallien-Krueger, the bass amps and speakers company. (b]GK Amplification Standard[/b] includes models of 3 Gallien-Krueger amps and several speaker models. All the functions of the original amps are available (Bi-Amp, filters), according to Audiffex. All controls are designed to do the same as their hardware counterparts. One GK amplifier and one GK speaker can be opened simultaneously. The price is $69. GK Amplification Pro includes models of 3 Gallien-Krueger amps and two independent speakers with selection from 4 models. More amps and speakers will follow. All the functions of the original amps are available (Bi-Amp, filters), according to Audiffex. All controls are designed to do the same as their hardware counterparts. One GK amplifier can be connected to two independent speakers, each of them can be of a different model. The price is $99. Both versions are available in RTAS and VST formats for Windows and Mac OS X. You can check out the web pages of the modeled products on the Gallien-Krueger web site: www.gallien-krueger.com. AAY-Audio aTube AAY-Audio has announced the release of aTube, a VST effect plug-in designed to process a signal like analog valve hardware. Lick Library Drum Legend Tuition DVD Series Lick Library has released a series of Drum Legend DVDs featuring Chad Smith, Taylor Hawkins, Dave Grohl, John Bonham and Stewart Copeland.